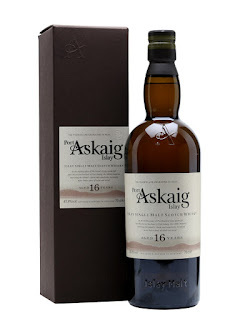 Continuing the Islay theme, I continued my Bristol Whisky Lounge session with a Port Askaig. It's not a distillery but a place, on Islay, very near Bunnahabhain and Caol Ila distilleries. This is a marriage of Bourbon and Sherry casks from a 'mystery' Islay distillery. I believe this is Caol Ila bottled by Speciality Drinks (The Whisky Exchange). They say that Port Askaig series is sourced from 4 or 5 different Islay distilleries but I've had a few now and all have tasted like Caol Ila to me. Nose: Fruity and soft. Pineapple, mango, some spice. Taste: Dry, smoke, soot, fruity with dried pineapple. Finish: Medium length. Dry with oak. Notes: A very soft and easy Caol Ila.